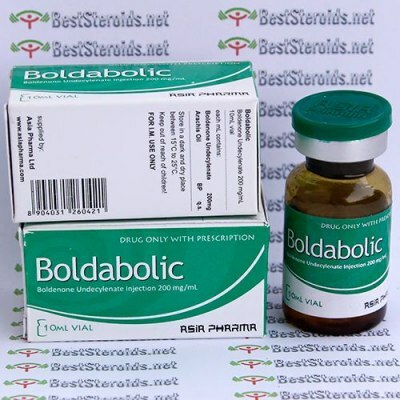 Boldabolic (boldenone undeclynate) is not a rapid mass builder, but will provide a slow but steady gain of strength and quality muscle mass. The most positive effects of this drug are seen when it is used for longer cycles, usually lasting at least 10 weeks in length. The muscle gained should not be the smooth bulk seen with androgens, but instead a very defined and solid look. When used in a cutting cycle, muscle hardness and density can be greatly improved when combining Boldabolic with a non-aromatizable steroid such as Trenabol or Winstrol. In order to maintain stable blood levels, Boldabolic should be injected at least once per week. It is most commonly used at a dosage of 400-700mg per week. This is my third cycle running Equi. Love the solid, vascularity it promotes. The appetite increase is ridiculous. Top notch product delivered by a top notch shop. Used this stuff for 3 solid months at 600mgs a week. Stacked with Oxandrolone at 50mgs a day, Proviron at 50mgs a day and Clen for the last two months at 80mcg every other day. Results were dramatic with increase in breathing, recovery rate, and fat loss. Ordered this and receive it under 2 weeks. Good clean product and I was definitely not disappointed. I'll definitely make sure this is my go to product for future Boldenone cycles. I'm just over half way through with it and not a single thing to complain about. Everything I expected with a very convenient dosage! This product works well only cycled with some test once but good solid gains. Strength and drive improved some and joints and overall sense of wellness was great.